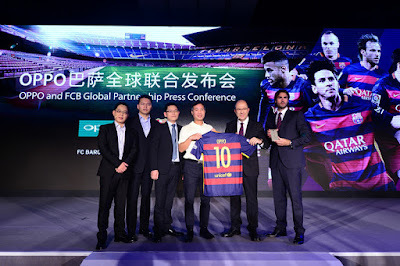 The evolving global smartphone brand OPPO celebrated its electrifying partnership with the world-renowned football club FC Barcelona, unveiling the FC Barcelona edition of its latest smartphone the OPPO R7 Plus in Beijing. With 5,000 units to be released, the $549 phone, dubbed the "Smartphone of Champions", is the first fan device to come out of OPPO's three-year partnership with FC Barcelona. The company will further mark the occasion with a giveaway and a charity auction of phones autographed by top players including Lionel Messi. "As OPPO continues its global expansion strategy, this partnership will enable us to reach even more global consumers at a faster and more dynamic pace," said Sky Li, Vice President of OPPO and Managing Director of International Mobile Business. "OPPO aims to be a top-three brand in Southeast Asia within the next three years, as well as make great strides forward in other markets. Our focus on providing the best smartphone photography experience is sure to take us there." In his first-ever trip to China as Vice Chairman of FC Barcelona, Manel Arroyo i Perez shared his vision for a mutually beneficial collaboration. "It is an honor for FC Barcelona to announce today this new sponsorship agreement with OPPO," he said. "OPPO products stand out for their design and quality, and we share values such as effort, ambition and teamwork. With this partnership, we start a long journey full of success that will bring us closer to our fans in China and around the world." Equipped with a 4100mAh battery and OPPO's own world's fastest VOOC Flash Charging technology, the R7 Plus FC Barcelona Edition will come with the club's logo, an FC Barcelona-themed wallpaper and a fan kit that includes an FC Barcelona protective case and more. The R7 Plus has already contributed to a wave of success for OPPO, helping it garner a number-two position in China's offline smartphone sales, second only to Apple as of July 2015. With a laser focus technology to quickly capture the focal point within 0.3 seconds, a RGBW sensor that is able to shoot high-clarity photos in low-light environments and an optimized anti-shake image stabilization function, the R7 Plus is the perfect choice for fans who seek to capture the energy and thrilling moments of sports events. Along with a 2.5D curved screen, 3GB of RAM and 32GB of memory, it also features a pressure-activated fingerprint recognition module on the back. The R7 Plus FC Barcelona Edition phones will be available for purchase online in stores such as OPPOStyle.com and in several OPPO overseas markets. OPPO will also hold a giveaway for the limited-edition phone this September, giving fans in over 20 of OPPO's overseas markets the chance to win big. Meanwhile, an eBay charity auction for five special units featuring autographs from some of FCB's top players including Lionel Messi, Andres Iniesta and Dani Alves will launch on September 12th, with all proceeds to be donated to the FC Barcelona Foundation. As its official partner in the mobile phone device category for the next three years, OPPO will collaborate with FC Barcelona on a wide range of activities and products, including football events, fan activities, TV advertisements and special-edition accessories, as well as an LED display at the Spanish club's home stadium of Camp Nou. FC Barcelona was founded on November 29, 1899, by initiative of a Swiss gentleman called Hans Maximilian Gamper, popularly known as Joan Gamper. Since it was founded, the club has had 44 different presidents. From Walter Wild to Josep Maria Bartomeu, Barca has grown into a massive social phenomenon that reaches far beyond the bounds of mere sport. The club has grown along with the city around it, and has come to represent Barcelona and Catalonia all around the world. FC Barcelona is one of the football clubs with more members in the world and its achievements have also made it one of the most successful. The many famous victories and all-time greats that have played for the club (Kubala, Cruyff, Maradona, Romario, Rivaldo, Ronaldinho, Messi, and so many more) form an important part of the Barca legacy. But these would be no more than historical anecdotes if it wasn't for the extraordinary social reality behind the events. OPPO is a leading global technology brand dedicated to providing consumers across the Americas, Africa, Europe, Oceania, and Asia with pioneering products that never fail to inspire and excite. At OPPO, we design, manufacture, and promote our own products, combining innovative technology with unique design, to ensure our customers always receive the best. 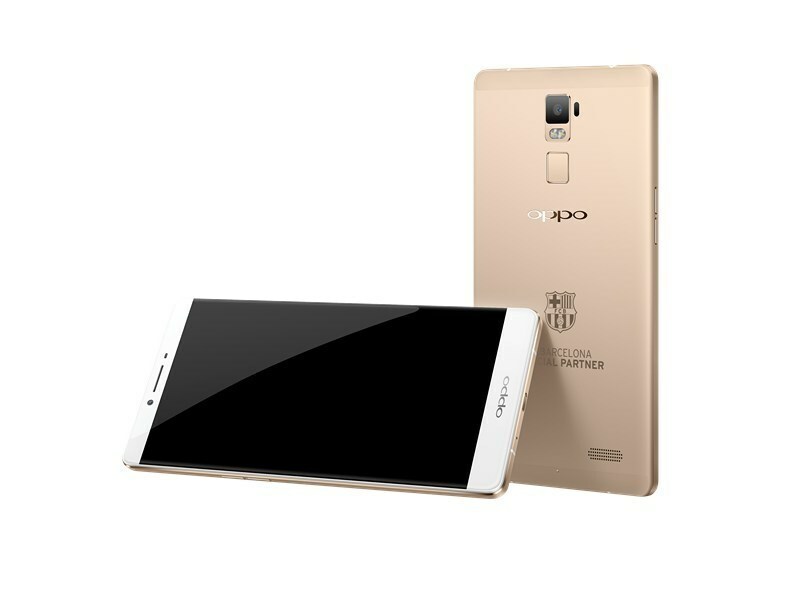 Founded in 2004, OPPO quickly proved itself in the market with its intense obsession for details. Each OPPO product encompasses a carefully selected array of attributes to specifically cater to users, combining impressive features with elegant designs. After entering the mobile phone market in 2008, OPPO quickly expanded into overseas markets a year later. OPPO mobile phones are currently available in over 20 markets and offered for online purchase in over 50 additional countries, with the brand already registered in 116 countries as of April 2015. But OPPO doesn't stop there. Using our passion for design and commitment to new technologies, OPPO has made a big impact in the audio-visual market by offering world-renowned, premium Blu-ray players in the United States and across Europe. For more information, please visit http://www.oppo.com/en/. 0 comments on "OPPO R7 Plus FC Barcelona Edition launched to celebrate three-year partnership with the world-renowned football club"